There is a decline at the $4 million mark, which I suspect has more to do with nomenclature than it does with data. I suspect the majority of the companies who raise $4 million or more seed rounds raise rounds that are the equivalent of series Bs, rather than As. 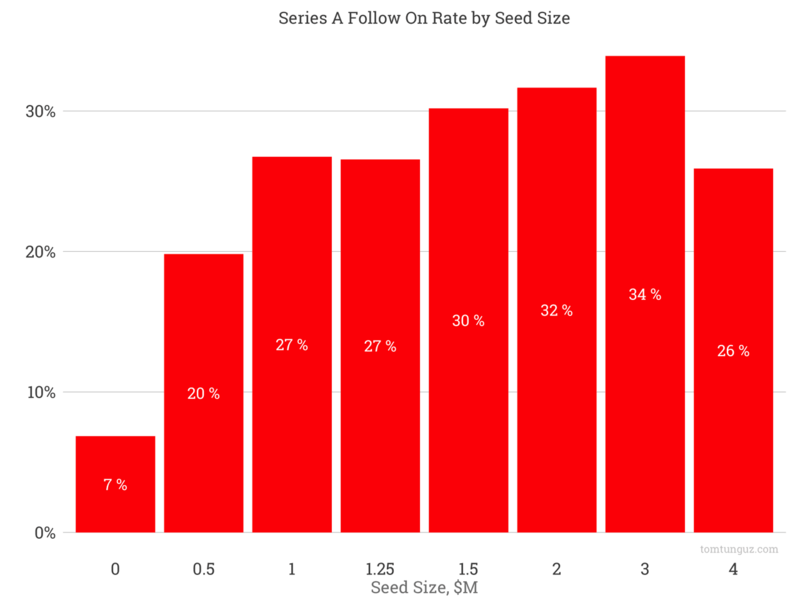 However, a larger seed round doesn’t guarantee a larger series A. 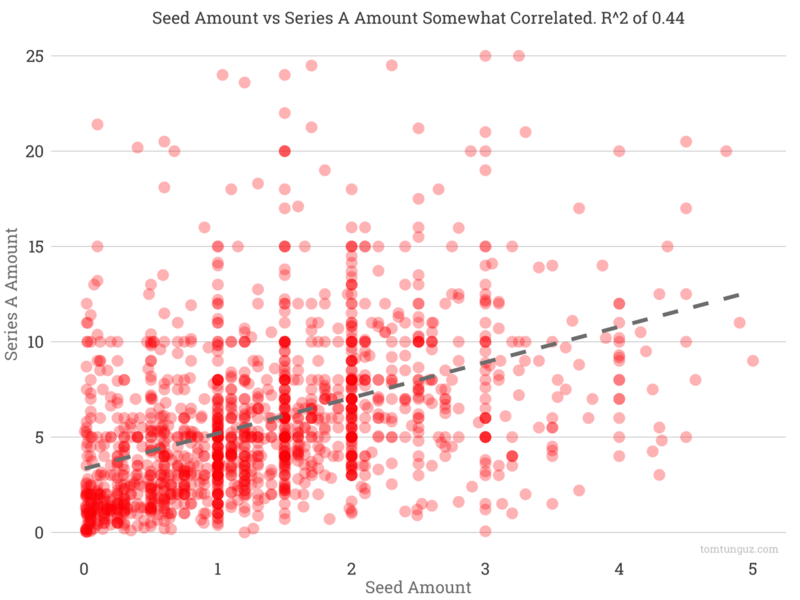 In fact the sizes of seed rounds are only somewhat correlated with the sizes of series As. The R^2 is 0.44. Sometimes early-stage companies can prove the hypothesis that underpins their business, and sometimes the product market fit simply isn’t there. Notably, this correlation is consistent over the last five years, bring between 0.2 and 0.44, with the exception of 2014 which saw a 0.72 correlation. This blip marks another indicator of the blind-bull market we lived through just two years ago. The chart above is a cumulative distribution function chart that shows the percentage of companies raising series A over time. 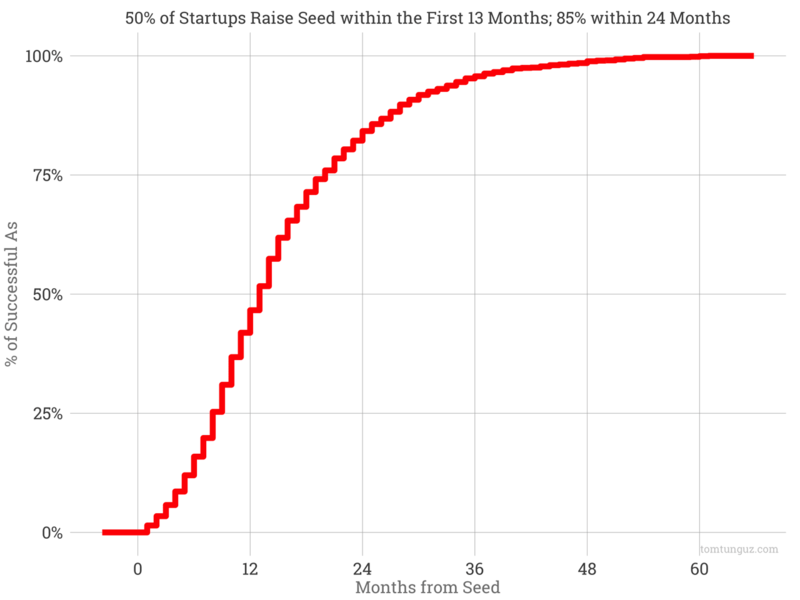 At ten months, 25% of seed companies that will eventually raise a series A have raised. At 12 months, that number spikes to 50%, and at two years, more than 80% will have raised their A. There we have certainly seen a dramatic shift of the seed market in the last two quarters, the data above suggests that the amount of money to raise to maximize the odds of success hasn’t changed over those five years, nor is the timing. Startups raising seed rounds of greater than $1 million and pursuing their series A 10 months to 24 months after the initial investment seemed greater success in the fund-raising market. Of course, success in the fund-raising market is a lagging indicator. Because a company raises exactly million dollars and goes out to raise a series A 12 months later doesn’t imply the business will successfully raise more capital. Milestone attainment is paramount and primary. The business needs to be on its way to achieving its vision to raise. No optimization of fundraising strategy or timing can obviate that requirement, especially not in today’s environment.